One year on from the Environment, Climate Change and Land Reform (ECCLR) Committee’s report on the Environmental Impacts of Salmon Farming, the first part of the 2018 Scottish Parliament Inquiry into the industry, Salmon and Trout Conservation Scotland (S&TCS) is concerned that the report is being allowed to gather dust by both Scottish Government and the industry. The 2018 Parliamentary Inquiry into salmon farming, as conducted by the ECCLR and REC Committees, was triggered by S&TCS' formal Petition to the Scottish Parliament’s Petitions Committee in 2016.
by the end of April 2018. The Scottish Salmon Producers’ Organisation has not honoured this deadline, nor is it publishing current farm by farm sea lice data in as close as possible to real time, as the Committee required. In contrast it is only publishing monthly sea lice averages per farm more than three months in arrears and it is to the Scottish Government’s shame that they have not amended secondary legislation to force transparency on this most important of issues. S&TCS concerns concentrate on the proven negative effects of salmon and rainbow trout farming at sea on wild salmonids - both Atlantic salmon and sea trout. It has been clear for many years that Scotland’s performance, particularly on sea lice, falls very far short of the internationally agreed NASCO goals. The development and introduction of full closed containment farming. The clear identification of a Scottish public authority charged with the statutory function to protect wild fish from the negative interactions of fish farming. No expansion of the industry while wild fish interactions remain uncontrolled. Relocation of existing sensitive sites. Full transparency and publication of sea lice, escapes, mortalities and disease information. The Scottish Government response is in danger of allowing the “status quo”, in terms of the regulation and legislation of salmon farms (and transparency in the way that the industry operates), to persist for the foreseeable future. This would be in stark contrast to what the ECCLR and REC Committees have both advocated after exhaustive examination and consideration. Both Committees identified major shortcomings in the way that the industry is permitted to operate. Action to remedy matters, rather than further prolonged discussion, must now be the priority. The REC committee report was published in November 2018, following the Environment, Climate Change and Land Reform (ECCLR) committee report. Both 2018 Parliamentary inquires into salmon farming, as conducted by the ECCLR and REC Committees, were triggered by S&TCS’ formal Petition to the Scottish Parliament’s Petitions Committee in 2016. “We applaud the REC Committee’s report, which cuts through many years of Scottish Government and industry spin and prevarication. The onus is now on Scottish Government to act without delay to implement the Report’s recommendations, giving wild fish much needed protection from sea lice and diseases emanating from salmon farms”. S&TCS look to the Scottish Government to take action today. A Christmas favourite it may be; but there is nothing festive nor joyous about farmed salmon. Salmon is considered by many to be a Christmas staple, its murky journey from net-pen to plate concealed behind tinsel-clad wrapping and slick marketing. Two parliamentary inquiries have this year confirmed the need for rapid change in salmon farming, which is causing widespread environmental destruction and the devastation of wild fish. We have campaigned for these changes for years; but what can be done until this happens...? This year’s reports from two Scottish Parliamentary Committees - Environment, Climate Change and Land Reform (ECCLR), and Rural Economy and Connectivity (REC) – following their inquiries into salmon farming, are both unequivocal; we have to adopt a far more precautionary approach to salmon farming to stop it damaging wild salmon and sea trout populations. Quite apart from the many millions of farmed salmon dying in their cages every year through disease, parasites and the negative effects of both physical and chemical treatments for sea lice, the stark fact is that politicians from all Scottish political parties agree that Scotland’s already beleaguered wild migratory fish stocks need to be protected from the impacts of open-net salmon farming on Scotland’s west coast and Islands. These reports vindicate Salmon & Trout Conservation’s strong campaigning over many years – the ECCLR and REC inquiries only came about because of our official Petition to Scottish Parliament in 2016 – and confirm what most of us have known for years. The challenge for us now is to drive through the Committees’ recommendations so that Scottish Government introduces, as a matter of urgency, far stronger regulation of the salmon farming industry. This includes more sensitive siting of farms, well away from wild salmon and sea trout migration routes. One of S&TC’s key objectives received prominence in the REC Committee report - the incentivisation of companies to invest in closed containment units that physically and biologically separate farmed salmon from the natural environment and wild fish. However, that all takes time. So what can we do? What we, as consumers, can do right now is to drive home the message to salmon producers by refusing to buy any farmed salmon products this Christmas (or indeed at any time until the industry becomes environmentally sustainable). Forget ‘organic’ salmon (here's why), or any other marketing gimmick that tries to tell you these fish are farmed responsibly. As it stands today, all open-net salmon farming can cause problems. None are truly environmentally sustainable. There is always the very real risk that any farm can suffer from too many sea lice parasites, which then release huge numbers of sea lice larvae into sea lochs, where they attack wild fish. Any farm can also suffer human error or storm damage that allows large numbers of farmed salmon to escape and breed with wild salmon and dilute natural gene pools. And those millions of dead salmon that never make it to the market because disease or chemical treatment, or just plain bad husbandry, kill them first. As the Scottish Parliamentary Committees have now identified, the Scottish Government has to act fast and decisively to save the worst parts of the industry from itself and, in doing so, save wild fish. Action now help ensure that wild salmon and sea trout are genuinely protected in Scotland. Until then, we can send a clear message to salmon producers, just as Scottish Parliamentary Committee members have this year - current salmon farming practices are just not acceptable anymore, and the industry must evolve quickly if it is to win back the public’s confidence to buy its products again. So, this Christmas (and until standards improve) take a stand for wild fish by taking a hard pass on any farmed salmon. Use the power you have - the power of the mighty Pound. Scottish Government must now act quickly to put in place greater protection for wild salmon and sea trout. Salmon and Trout Conservation Scotland (S&TCS) has warmly welcomed the Rural Economy and Connectivity (REC) Committee’s report on salmon farming, published today. The report builds on the Environment, Climate Change and Land Reform (ECCLR) Committee’s report published in March. “This Report is a strong vindication of the campaign S&TCS has spearheaded for some years now, and the arguments we have been putting forward, often in the face of sharp criticism from both the industry and Scottish Government alike. We are pleased to see that the REC Committee has recognised that the law is currently insufficient to protect wild salmon and sea trout from the damaging impacts of salmon farming. Sea lice data in real time to be published in real-time, made mandatory and “the data provided should be that which is required to inform the regulatory and enforcement regimes, as opposed to that which the industry itself takes it upon itself to produce” (Recommendations 19 to 21). “Scottish Government has a clear duty to safeguard the coastal environment and those species, including wild salmon and sea trout, that depend upon healthy coastal ecosystems. We applaud the REC Committee’s report, which cuts through many years of Scottish Government and industry spin and prevarication. The onus is now on Scottish Government to act without delay to implement the Report’s recommendations, giving wild fish much needed protection from sea lice and diseases emanating from salmon farms”. This year’s Parliamentary inquiry into salmon farming, as conducted by the ECCLR and REC Committees, was triggered by S&TCS’ formal Petition to the Scottish Parliament’s Petitions Committee in 2016. By our Head of Science and Policy, Dr Janina Gray. The original article was written for Countryside and Wildlife Link. What would a third dry winter mean for wildlife and habitats? Worryingly low water flows are of major concern to much wildlife, particularly salmon which rely on flowing rivers to travel to estuaries to spawn. As our minds start focusing in on Christmas after a warm summer and mild autumn, the elephant in the room not receiving much attention at the moment, is the continued dry weather which could drive us into a 3rd dry winter. Whilst we are all enjoying a November that doesn’t involve the typical 3 inches of mud to contend with, what does this mean for the environment? 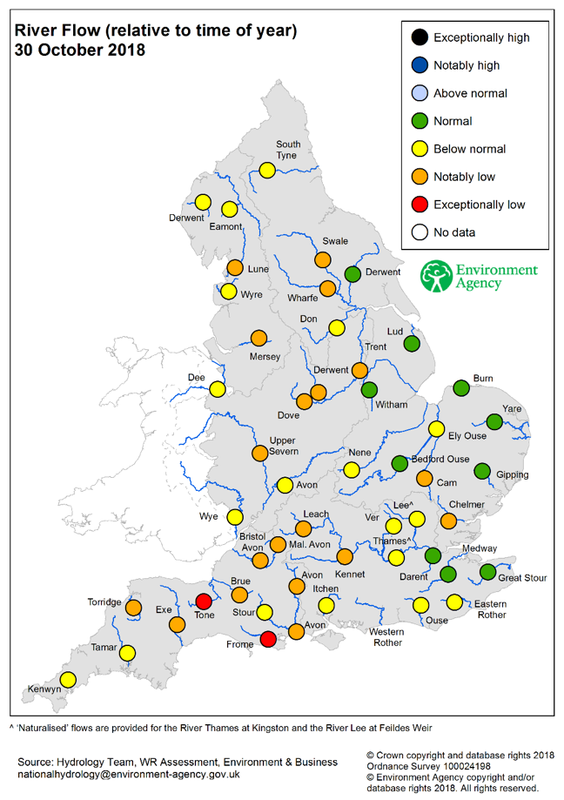 Environment Agency (EA) data shows river flows, as of 30 October, are below normal or notably low for most of the south and west of England and all but 4 EA areas are classified as in prolonged dry weather. Reservoirs in the Pennines and south west are still at risk from lower than normal levels going into winter. And the continuing dry autumn and consequent high soil moisture deficits, look set to result in a continued delay of winter groundwater recharge in southern and eastern counties. For fish and our chalk streams the impacts of low flow will start being felt now. Reduced groundwater will severely impact the resilience of our chalk streams, and the low flows will increase siltation and die off of water crowfoot, which is a crucial part of the ecosystem. Reports around the country suggest this year is looking catastrophic for salmon. Salmon spawning should be occurring between now and end of January, but low flows in the summer and up to now, have meant salmon arriving in our estuaries are delayed or just never entering freshwater. They need sufficient flow to encourage them to run, and many in-river obstacles (even fish passes) only allow access above certain water heights. If the fish do manage to make it upstream, past all the predators (from which they have less cover to hide), the loss of wetted area will severely impact the whole year classes of juveniles, forcing them to lay eggs in sub-optimal locations. If the low flows continue to May 2019, this will also impact downstream salmon and sea trouts molt migration, as well as coarse fish and lamprey spawning for the same reasons. Salinity incursions to rivers will kill freshwater organisms. Dried heathlands, grasslands, peat lands and forestry will have increased risk of fires. Decreased wetted areas in ponds, lakes and in rivers combined with low flows will adversely impact on aquatic insects and amphibians. Decreased wetted areas will impact breeding bird populations. Low flows and, indeed, droughts are natural events and healthy habitats and species populations tend to be resilient to them. However, with only 14% of our rivers currently classified as healthy and salmon populations in a dire state, the potential impact of these weather events this winter is very worrying. We can do little about changing weather patterns, except to address man-made impacts, but we can collectively lobby government to take excessive water abstraction – and its solutions – more seriously, especially the need for water companies to find new sources of water that have less impact on the environment. That means solutions which will include increasing demand management, improved natural and man-made water retention in catchments and, where necessary, reservoirs or desalination plants. Above all, we have to make sure that government departments, Ofwat etc fully appreciate that ground waters and many of our rivers just cannot take existing levels of abstraction, let alone the increases expected in areas of massive new housing and infrastructure construction. We must continue to press ever harder for government commitment to protecting the water environment, and a new, enlightened approach to abstraction policy seems a great place to start. Similar scenarios play out at dinner tables up and down the UK, particularly during the festive season. But is eating “organic” farmed salmon really environmentally responsible? The blunt and unequivocal answer is, no! “Organic” salmon is a con. It is simply a marketing ploy‎, aimed at the naive and ignorant well-heeled, especially those who frequent the more prestigious supermarkets and food emporiums, to persuade them to pay a premium price for something that is almost the same as bog standard farmed salmon. The only real difference is that “organic” salmon is stocked in open net cages at a lower density. There is no separation between the farmed fish and the wider environment; fish faeces, in vast quantities, still pollutes and destroys the integrity of the seabed. “Organic” salmon farmers still use all the same chemicals, including lice treatments, thus killing other crustaceans in the vicinity. The problems with lice and escapes are just as prevalent in “organic” salmon - hence the impacts on wild fish are identical. The Soil Association’s indefensible endorsement of any farmed salmon undermines the credibility of, and indeed is an indelible stain on, the organisation’s reputation. So, the next time you hear a smug announcement from your host that the salmon being served is so-called “organic” and therefore by implication “is ok to eat”, I suggest giving it a wide berth. At the same time, you should tactfully explain that he or she is being duped and, if they give a damn about the environmental damage all salmon farming, including that purporting to be “organic”, causes (especially to wild salmon and sea trout in the west Highlands and Islands), they should not allow such dross of sham pedigree to besmirch and contaminate their table.